The Library & Information Center of the University of Macedonia aims to develop and improve its services, therefore it has decided to create and operate the Library Electronic Scientific Journal Publishing Service, using the open source software Open Journal Systems. Main scope of the Service is the concentration, sharing, dissemination, recording and preservation of the knowledge produced by the Faculty of the academic community of University of Macedonia, as well as other scientific organizations and institutes, following the open access business model (through the “golden road”). In that way, the scholarly communication is enhanced and the presence of the Library in a continuously varying digital environment is ensured. The Library Electronic Scientific Journal Publishing Service is developed in the framework of the project “Open Access Scholarly e-Content at UOM: supporting library services for its organization, promotion, publication & interconnection” (NSRF 2007-2013, OP Digital Convergence, B2, MIS 304170). All the selected electronic bibliography related to the scholarly communication and the library electronic scientific journal publishing services developed from international and Greek libraries. Παπαθεοδώρου, Χ., & Τσιμπόγλου, Φ. (2001). Έκδοση και διαχείριση ηλεκτρονικών περιοδικών από βιβλιοθήκες. Παρουσιάστηκε στο 10ο Πανελλήνιο Συνέδριο Ακαδημαϊκών Βιβλιοθηκών, Θεσσαλονίκη. Björk, B.-C. (2004). Open access to scientific publications – an analysis of the barriers to change? Information Research, 9(2). Craigle, V., Herbert, J., Morrow, A., & Mower, A. (2013). The Development of Library-Led Publishing Services at the University of Utah. Στο Library Publishing Toolkit. Geneseo, NY: IDS Project Press. de Sandes-Guimarães, L. V., & de Souza Costa, S. M. (2012). Brazilian Scientific Journals That Use the Open Journal Systems (ojs): A Quality Analysis. Revista de Gestão da Tecnologia e Sistemas de Informação / Journal of Information Systems & Technology Management, 9(2), 61. Felczak, M., Lorimer, R., & Smith, R. (2007). From production to publishing at CJC online: Experiences, insights, and considerations for adoption. First Monday, 12(10). Gold or green: which is the best shade of open access? (2012, Ιούλιος 5). Hahn, K. L. (2008). Research Library Publishing Services: New Options for University Publishing. Association of Research Libraries. Harnad, S. (2011). Open access is a research community matter, not a publishing community matter. Lifelong learning in Europe, 16(2), 117–118. LPC | Library Publishing Directory 2014. (χ.χ.). Mounier, P. (2011). Freemium as a sustainable economic model for open access electronic publishing in humanities and social sciences. Information Services & Use, 31(3/4), 225–233. Mullins, J., Murray-Rust, C., Ogburn, J., Crow, R., Ivins, O., Mower, A., … Watkinson, C. (2012). Library Publishing Services: Strategies for Success: Final Research Report (March 2012). Purdue University Press e-books, 24. Parang, E., & Saunders, L. (1994, Αύγουστος). SPEC Kit 202, Electronic Journals in ARL Libraries: Issues and Trends. ARL. Phillips, L. L. (2007). Newfound Press: The digital imprint of the University of Tennessee Libraries. First Monday, 12(10). Raju, R., Smith, I., Gibson, H., & Talliard, P. (2012). 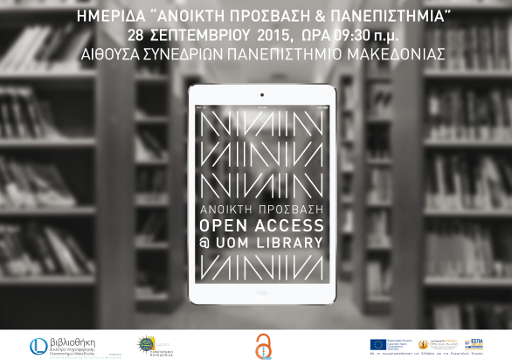 Open access: are we there yet? – the case of Stellenbosch University, South Africa. South African Journal of Libraries and Information Science, 80(2). Samuels, R. G., & Griffy, H. (2012). Evaluating Open Source Software for Use in Library Initiatives: A Case Study Involving Electronic Publishing. portal: Libraries and the Academy, 12(1), 41–62. Solomon, D. J. (2013). Digital Distribution of Academic Journals and its Impact on Scholarly Communication: Looking Back After 20 Years. The Journal of Academic Librarianship, 39(1), 23–28. Willinsky, J. (2005). Open Journal Systems: An example of open source software for journal management and publishing. Library Hi Tech, 23(4), 504. Willis, J., Baron, J., Lee, R.-A., Gozza-Cohen, M., & Currie, A. (2010). Scholarly Knowledge Development and Dissemination in an International Context: Approaches and Tools for Higher Education. Computers in the Schools, 27(3-4), 155–199. Xia, J. (2009). Library Publishing as a New Model of Scholarly Communication. Journal of Scholarly Publishing, 40(4), 370–383. Visit the websites of international organizations that have played an important role in the support and enhancement of the academic libraries electronic scientific journals publishing activity, as well as websites related to copyright issues. According to the current bibliography, there are certain academic libraries with an outstanding outcome of their efforts to provide services of electronic scientific journal publishing. Furthermore, Greek academic libraries and libraries from South Africa are worth to be mentioned, as a proof of the wide spreading of such practices internationally.